Any healthy list of “Factors that Overwhelm New Teachers” is incomplete without a mention of “the stuff.” The combined accumulation of what you bring to the classroom and what you inherit from your predecessor may have you spiraling. You’ll need to get organized for the sake of your own efficiency, but most of all for the sake of your students. If you find yourself standing in the middle of your classroom asking, “Does this stuff exist so that I can organize it or so that my students can use it to learn,” it’s time to make a change. Let me assure you—there’s a better way. It is not a sin to throw deadweight educational resources away. You may not want to purge too much your first year, but no one wins a prize for the storage closet with the most stuff. Let’s look at the why and how of organization. Believe in the value of organization. If all new teachers really bought in to how vital classroom organization is to student learning and behavior, you would have no problem investing the time to get meticulously organized. 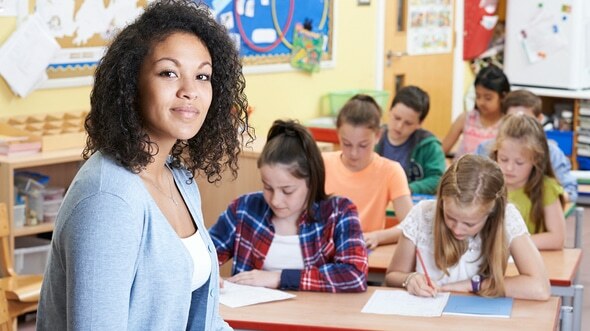 Think back on the annoying issues you dealt with in student teaching. Not the giant issues such as fights—but the daily problems that wore you down and ate away at your effectiveness. How many of those could you trace back to poor organization? Were you able to solve any problems by rearranging desks or systematizing a transition? For many students, breakdowns come in transitions. When transitions feel less like transitions and more like routines or habits, students feel safe in knowing the next step. The room stays calm and peaceful and is less likely to erupt in chaos. Create obvious spaces. At least half of your students, and more like three quarters, will not have a natural bent toward organization. For many students, a file is a file, a tub is a tub. Organizing books by reading level or matching scissor bin #1 with table #1 is not intuitive. You’ll do everyone a favor by making your organizational system simple and eye-catching. Think through traffic patterns. At first glance, it may seem obvious that you would keep all the scissors together on one bookshelf. However, if you observe that your “supply helpers” tend to congregate and get into mischief when sent on their mission to secure scissors for their tables, you may want to re-organized. Keeping all supplies for each work station strategically place in opposite corners of the room may turn out to be a better strategy. Avoid clutter. Students lack the ability to discriminate between one heap of clutter and the next. Avoid clutter. Walk through your day. Think through all your normal procedures; for example, passing in homework. If you say, “Pass in your homework,” you can expect to see papers flying through the air, kids bonking the student in front of them on the head, kids up out of their seats taking a stroll. You’ll wonder if you said, “Please mutiny,” by mistake. Instead, think how to minimize confusion and get the job done—Homework on the front desk before class begins? Wait for the homework behind you and pass the stack up together? Choose a strategy that works for you. Model it. Enforce it until it becomes routine. At the beginning of the year, keep things simple. As students (and you!) master the simple, add more complexity. A commitment to organization, efficiency, and peace will make a measurable difference in your and your students’ days and year.